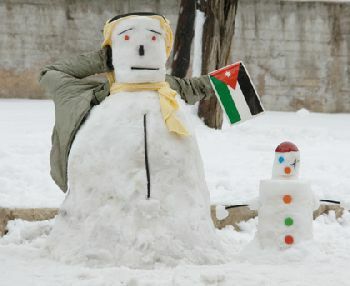 The contest is heating up among Jordanian bloggers who are vying for the top place in making a snowman, erm, woman – prompting one blogger to call a truce. With the Internet slowing down across the Middle East, it was only natural for Jordan's bloggers to pour their creative juices elsewhere. And since pictures speak volumes, I will leave you with with just that in this post. Why waste my time and risk catching pneumonia making a huge, beer-belly snowman? For whatever is holy to you pleaaaaaaaaaaase STOP with THE SNOW POSTS. Seriously, stop, it all looks the same, all the pictures. EVEN the snow men look the same. 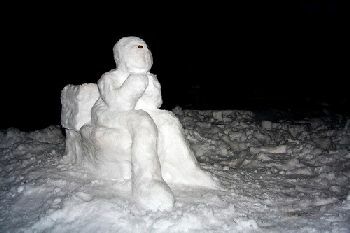 Middle East: Let it Snow ..
7aki is a she not a he :D .
What a great post, Amira. Thanks!